MESA Supplies - Apparel Decorating Solutions! MESA Supplies offers a large selection of brand-name, high quality embroidery supplies at very competitive wholesale prices. 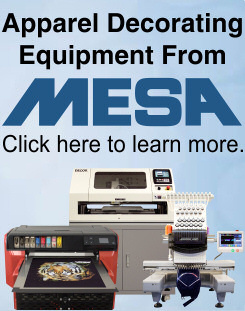 Ordering embroidery thread, needles, bobbins, backing, nippers and more is now easier than ever before, and MESA Supplies is continually working with manufacturers to bring you the best prices possible. Introducing Endura Embroidery Thread, setting the new standard for premium yet affordable commercial embroidery thread. Available in 189 polyester colors, plus metallic, glow in the dark, and neon colors. Try it now before the introductory sale expires and save up to 22&percnt; off the regular low price. MESA only offers the highest quality DTG Inks. Image Armor Ink offers bright colors, fast dry times, and stands up well to repeated washing. Dupont Artistri Ink, the long-time reliable standard in DTG inks. MESA Supplies offers bling supplies such as hotfix rhinestones, rhinestuds, and transfer paper, all suitable for use with DECOR, CAMS or any heat-transfer rhinestone applications. Looking for chenille supplies? MESA offers a growing selection of chenille needles and accessories, plus chenille yarn in a variety of colors, with matching chenille scrim colors. Many products offer even bigger savings when buying quantities. Check the details page of any product to view discount information. Whether you're a commercial embroiderer, professional garment printer, or other apparel decorating professional, you know how important it is to offer high quality products at competitive prices. MESA strives to make this easy for you by offering the products you need while working with manufacturers to keep pricing competitive. If you don't find something you need, or you find a better price, please let us know.